Do we need to moderate meat consumption in order to feed the world in 2050? Given beef producers’ track record of ingenuity, it’s possible but not probable. A Twitter follower (Tweep? Twriend? Twquaintance?) asked yesterday whether we could really supply 9+ billion people with 250 lb of meat per capita in 2050. The question stemmed from a recent paper in which Stockholm scientists claimed that we would all have to reduce meat consumption by 75% by 2050 in order to have enough water to supply the population, and a subsequent rejoinder from the American Society of Animal Science in which several scientists noted the flaws in the Swedish paper, the importance of animal-source foods in the diet and the use of marginal land for grazing livestock. On Twitter, the comment was made that there appear to be two distinct sides to this argument – one side (the environmentalists and anti-animal agriculture groups) warning that we need to drastically cut meat consumption in order to feed everybody, and the other (the meat industry) turning a blind eye and effectively promoting the idea that we can eat all the meat that we like without having any environmental impact. Globally, we’re nowhere near 250 lb meat consumption per capita, even US consumers who are often portrayed as meat-guzzling bacon-o-philes by the Huffington Post et al. have an average annual consumption of 171 lb according to the USDA. As current beef consumption is 58 lb per capita in the USA, that’s a lot of pork and chicken that will presumably make up the difference. There’s no doubt that increases in both population size and per capita income in regions such as China and India will have a significant impact on global meat consumption by 2050. However, I have to admit I find the “blind eye” comment a little hard to swallow, given, for example, the beef industry’s commitment to measuring and mitigating both resource use and carbon emissions through current life cycle analysis research, and involvement with groups such as the Global Roundtable for Sustainable Beef. That’s exactly what the beef industry has done, is doing and will continue to do into the future. Since 1977, the US beef industry has cut water use by 12%, land use by 33% and the carbon footprint of one lb of beef by 16%. Providing that producers are still able to use management practices and technologies that improve efficiency, further reductions should be seen in future. Yet we have to look beyond the idea that the USA can feed the world by itself. 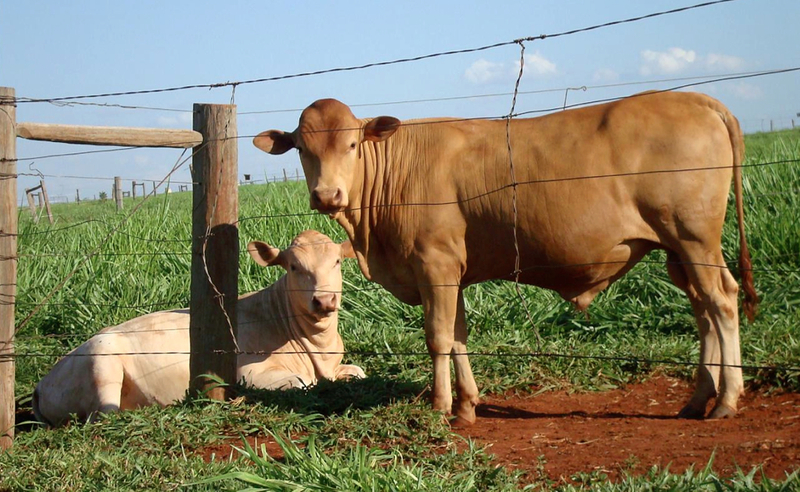 I’m writing this post from Brazil, which has a huge beef industry, yet on average, Brazilian beef cattle first calve at 4 years of age, only 67% of cows have a calf each year and beef animals take 3 years to reach slaughter weight. Comparisons to the equivalent US figures (2 years, 91% and 15 months respectively), show the potential for amazing reductions in resource use from Brazilian beef production, and this, along with other less-efficient systems, is where we have to focus in future. It’s not about forcing US-style production on every producer; it’s about enabling producers to make the best and most efficient use of resources according to their management system and region. Brazil has just approved the use of beta-agonists in beef production, which will allow the production of more beef using fewer resources. This is just one step on the road to improved efficiency. So do we need to moderate meat consumption in order to feed the world in 2050? I’d love to be able to answer this by citing a published paper that has taken improvements in meat industry productivity over the next 40 years into account rather than assuming a “business as normal” outcome. In the absence of such a paper, I’ll give a Magic 8-Ball type answer: Given beef producers’ track record of ingenuity, it’s possible but not probable. Globally, there are huge opportunities for improved efficiency and concurrent reductions in resource use from all meat production systems – the key is not to reduce meat production but simply to produce it more efficiently.